An opposing player isn’t necessary if you’re looking for a fun, challenging card game to play. There are several versions of solitaire that are challenging that you can play by yourself. One of the most difficult versions of solitaire is Free Cell, but by learning the rules and how to play the Free Cell card game, you can learn how to win it. While most people know Free Cell because it comes with Microsoft Windows, it began as a card game. The inventor of this version of solitaire was a medical student by the name of Paul Alfille. He created the game from another one called Baker’s Game. It didn’t start out being strictly a computer game because Alfille used a deck of cards to figure out the game’s moves. While playing it, he noticed the cards always ended up in suits. His main objective in playing Free Cell was to figure out how the mathematics worked and the probabilities of achieving a positive outcome. Although he may have wanted to know how many games were winnable, there is a difference between how many games can be won versus how many are won. If the cards are not played correctly, then the player may not win the game. As Alfille continued to play the game, he created several variations of it. The original version has eight columns, but he was able to invent versions with four to 10 columns and one to 10 free cells. There is a ranking system for each version so players can track their winning percentages. Alfille wrote the first version of Free Cell for computers in 1978 for the PLATO computer system. Someone else, Jim Horne, wrote a character-based version of the game for DOS, and then he eventually wrote a full graphical version for Windows. Microsoft started including the game, that they dubbed Microsoft Free Cell, in the Microsoft Entertainment Pack 2 in 1992. Later versions were included with Windows for Workgroups, Win32, Windows 95, and Windows 98. It is still offered on Windows in the Microsoft Solitaire Collection on Windows 10. All that is needed to play the Free Cell card game is a deck of 52 playing cards. The objective of the game is to move all the cards into four foundation piles in ascending order, from ace to king, of the same suits. The layout of the cards will include four free cells at the top left hand of the tableau and the four foundations at the top right. Then there will be the tableau below them. The cards should be dealt face up into eight tableau piles with the first four piles to the left containing seven cards and the four piles to the right containing six. The piles, or columns, should contain cards of alternating colors. So, if you turn over a black card, then a red card, they can go into the same column, but if you turn over two blacks in a row, then you need to start building the second column. The cards should be dealt in such a manner until you run out of them. The cards on the tableau can only be moved as a group if there are sufficient free cells to move one card individually. So, if you have six cards on the board in descending order that you want to move to a higher card, you can only move five of them if there are no cards in the cells. The cells can only contain one card each, so try to keep them open if possible. Before you begin playing, make sure to shuffle the deck several times to mix the cards. Then deal them into eight tableau piles as previously described. After the cards have been dealt, look for plays on the tableau. 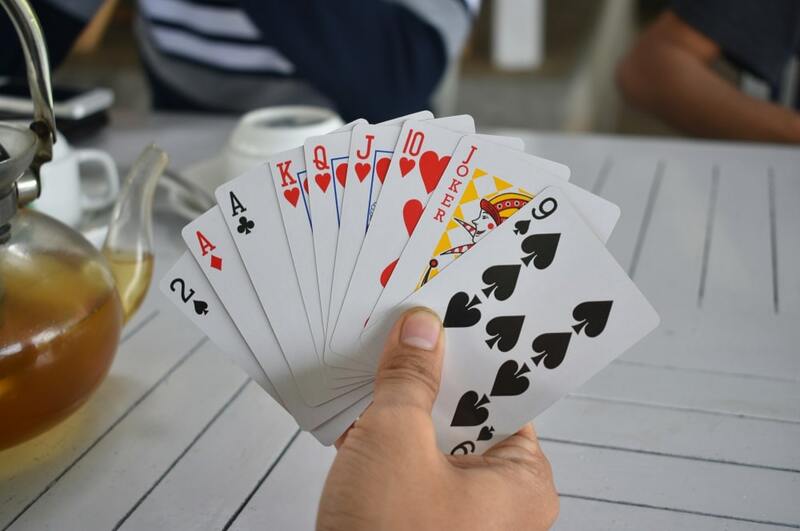 Cards should be in descending order on the tableau, so if you have a seven of hearts showing and a six of spades, the six could be moved to the seven. If there is an ace on the tableau that is free to move, then start a foundation pile with it. Be careful about putting too many cards into descending over because you can only move a maximum of five cards if the free cells are empty. As you put cards into the cells, you will only be able to move as many cards as there are open cells, plus one. So, if there are three open free cells, then you can move four cards. The cards can be moved back and forth between piles to help access the cards beneath the others that are in descending order. So, if you have a black six, a red five, and a black four and there are four open free cells, you could move those cards to a red seven to access the next card beneath the black six. As cards are moved between tableau piles and to the foundation piles, if the last card in a column is played, then you can move a sequence of cards into the empty spot. You can also combine moving cards into the open free cells and the empty column to help provide access to more cards. For instance, if there are three empty cells and an open column, you could move up to seven cards. Three would go into the empty cells and the other four to the open column to help access other available cards. If you don’t have an available play, then you can move a card to a free cell to gain access to the card beneath it. Before moving cards to the cells, look for possible plays on the tableau, even if it means splitting up the cards in sequence between columns to access other playable cards. The free cells are also temporary storage solutions to help you gain access to other playable cards. You can move cards to a cell to play the card beneath it and then play a card in one of the free cells if there is an available spot for it. As you gain access to aces, they should be moved to create foundation piles. Then, as ascending cards become accessible, they should go into the proper foundation pile if it is playable. However, examine the tableau first to see if the better play for the card is on another pile to free a blocked card with a better play. If you can create all four foundation piles from the ace to king, then you will win the game. However, if you make as many moves as you can on the tableau and free cells, and there is not another available play, then you will have lost the card game Free Cell. There are some simple tips that can make it easier to win at Free Cell. Here is one of the strategies you should consider using when playing the free cell solitaire card game. As soon as you finish dealing the cards into tableau piles, examine the board to find low cards buried deep into the columns. Then, try to form a strategy to free them as soon as possible. Games with low cards near the bottom of the columns will be easier to win than those with low cards buried deep into the columns. Try to keep as many free cells open as you can throughout the course of the game. Since you can only move as many cards as there are open free cells plus one, it becomes more difficult to move cards with only one or two cells available. Try to clear tableau columns if possible. When a column is open, it is more powerful than a free cell because it allows you to move twice as many cards in a sequence. If a column is free, try to file it with a packed sequence of cards in alternating colors. If there are columns with nothing but such a sequence, you should ignore it and try to play the other columns first to reveal low foundation cards. When playing the tableau, try to create packed sequences of cards before using the free cells to help gain access to blocked cards. By learning the rules and using the tips for playing the Free Cell card game, you should be able to increase your winning percentage no matter which variation you’re playing. If you’ve tried playing the game without knowing the rules, you probably didn’t win very often. However, now that you know them, you can win more often, and you may find the game more enjoyable.